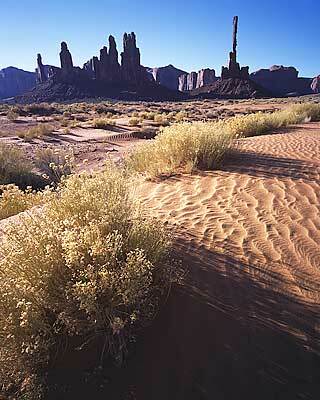 To me Monument Valley represents the quintessential Western landscape. 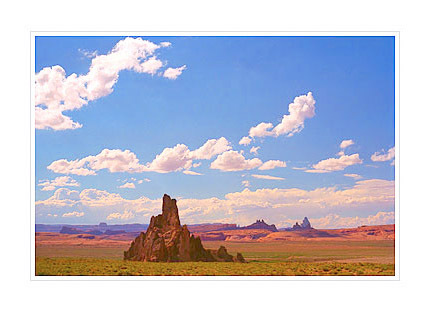 Featured as a backdrop in many Western Movies it was made world famous by John Ford who created several of his best known films there. 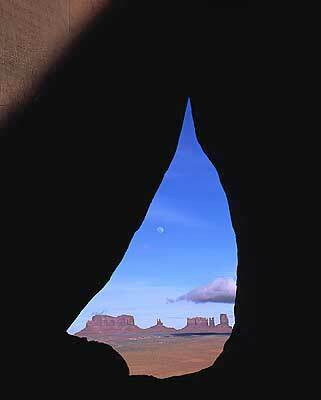 My fascination with Monument Valley comes from the incredible sight one experiences when first entering the valley. Here are these huge stone monoliths, shaped like mittens, one the exact inverse of the other and the third one missing a thumb as if to say "this is for real, see, only two have thumbs. If it was made up we would all three have the same shape." 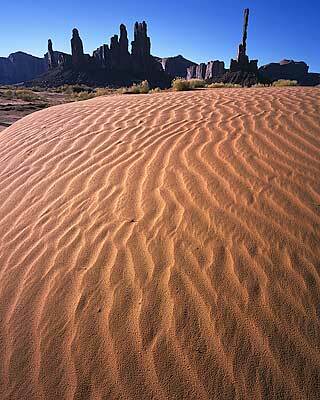 For a photographer Monument Valley is a serious challenge. While it is easy to take a good photograph from the main overlook given the natural drama of the location it is quite difficult to take an excellent photograph or one which has not become a cliché. 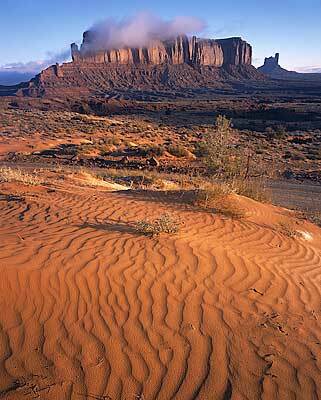 Sunset and sunrise are both excellent times to photograph Monument Valley. From the main overlook at the Visitor Center one looks pretty much straight East towards the Mittens. 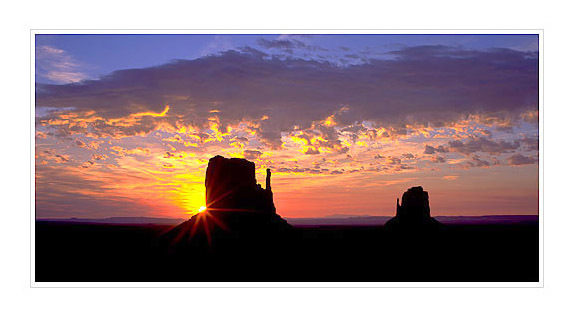 At sunrise the sun comes up behind the Left Mitten on the summer solstice and far to the right of all three monuments on the winter solstice. 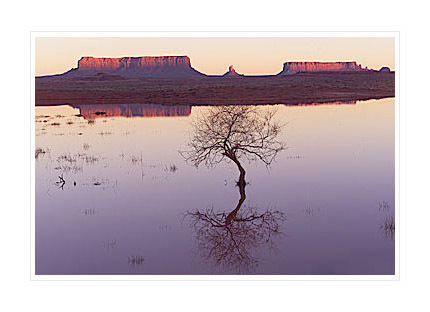 At sunset it is best not to wait until the sun is too low in the sky otherwise the mesa on which the Visitor Center is located will cast a shadow onto the monuments before the sun actually sets. 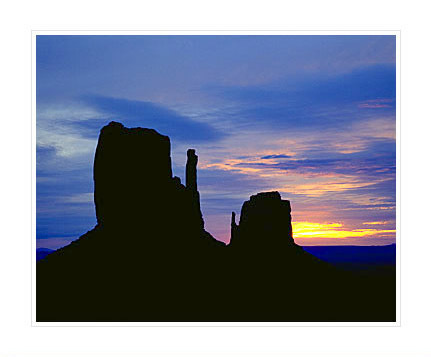 For this reason it is best to photograph perhaps an hour before sunset or to wait until the sun is gone and photograph at dusk. After sunset there is about half an hour of usable time before it becomes too dark to photograph. Although there is no longer any direct light the colors in the landscape are actually more saturated than our eyes can tell. 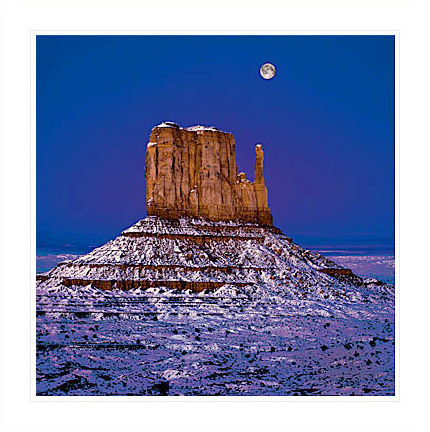 You will have to use a tripod at that time because exposure times are much longer and your efforts will be rewarded with photographs that have a very quiet quality and yet a relatively intense color saturation. 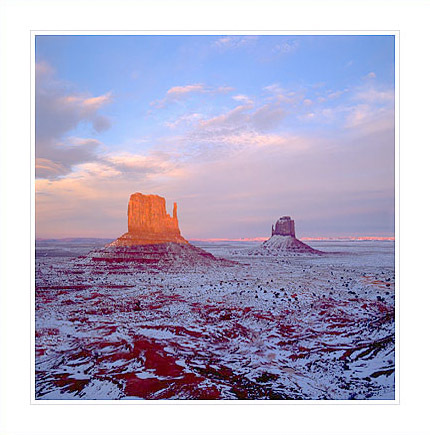 The photograph below was taken in December just after a snowstorm and about 15 minutes after sunset. Reflections from clouds in the western sky gave the rock a golden color while the transition between day and night tinted the sky a rich dark blue hue. The snow added reflectivity on the ground lighting the scene in an otherworldly fashion. This photograph was taken with the Kodak DCS 560 6 million pixels digital camera which I tested for Electronic Publishing Magazine. The tests, together with a multi-page report on the camera and my impressions of it, were publised in the February 1998 issue of Electronic Publishing. I saw the image in black and white in my mind's eye. However, I originally shot in color because the DCS 560 did not include a black and white mode. In fact no professional digital camera, to my knowledge, includes a built-in black and white mode. I created the black and white version in photoshop by reducing the original file to a grayscale image and then adding a sepia tone to it in RGB mode. 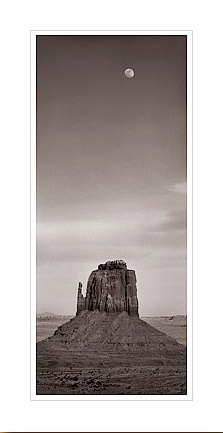 The original color photograph was published on the Cover of Electronic Publishing with a serious cropping to make it vertical instead of an horizontal. The cover is below and provides an interesting insight on how cropping can affect an image.